Silver Street Ceilidh Band is an eclectic group of some of the finest (and friendliest) musicians on the scene. Although a London ceilidh band, their music has roots in the rich seam of traditional music in Scotland and the North East of England. They also play tunes from elsewhere in England, Ireland and even further afield. They boast decades of experience of playing for dancing between them (despite their youthful looks…), and know how to ensure you – and your guests – have a fabulous time! The band is made up of dual fiddles, melodeon and piano. They carefully explain the dances to ensure everyone has as much fun as possible – irrespective of experience. Take a look at their pics, videos and have a listen to their sound clips. Silver Street Ceilidh Band is a fixed-lineup band, so only normally performs when every band member is able to make the date – they don’t offer a smaller lineup option or ‘dep’ out band members unless specifically agreed with the client. That means if you book Si’ver Street Ceilidh Band you’ll get Martin calling the dances and on fiddle, Beth on lead fiddle, Joe on button accordion and Will on keys! NOTE: Many bands, particulary London-based bands, operate from a ‘pool’ of musicians. These are often very good (we all individually also perform with other such groups), but you don’t know for definite who you’ll get, and in any case it’s unlikely to be as slick and tight as a set lineup such as ours. Silver Street Ceilidh Band played last night at our school fundraiser and were absolutely amazing. As musicians they are superb and they had the floor full all night. Martin was a fantastic caller and everyone was able to join in. What was supposed to be a ‘one-off’ charity night may now become a yearly event. Can’t recommend highly enough. The band played at my daughter's wedding and were nothing short of excellent; skilled musicians, Martin is an excellent caller. Everyone joined in the dancing and thoroughly enjoyed themselves. Thank you so much. Silver Street Ceilidh band played at our August wedding and were fantastic. We were running behind and they were very flexible - agreeing to play much later than originally agreed. Martin was great at calling - giving clear , easy to follow instructions and playing the (slightly boisterous) crowd very nicely. The whole band were really friendly and played great music with natural ease. I would 100% recommend!!! Silver Street played at my wedding at the end of June and made an amazing day even more perfect! 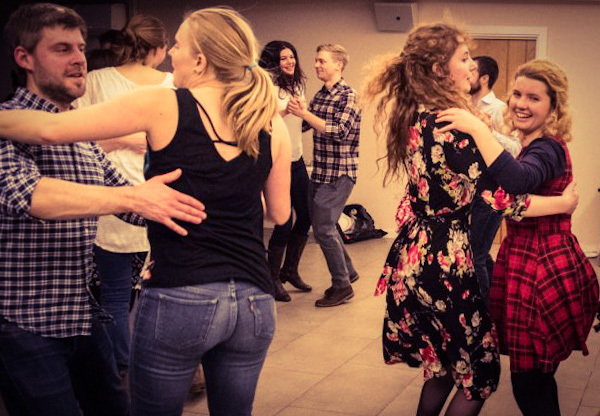 Hannah's calling was perfectly pitched, meaning that newbies and long-established ceilidhers were all up and dancing together, and the music was sublime. They were so helpful and friendly, and worked really well with the venue as well. 15/10, would 100% recommend! Silver Street gave me my first Ceilidh experience and it was a blast! Clear directions, pitch perfect music and buckets of enthusiasm meant I got involved and had a great time despite my two left feet. This is a great band, very accomplished and Martin is a very good caller as well as being a brilliant violinist! All players did a great job, the music is lively and the pace is just right. We enjoyed a great evening of dancing at our friends’ marriage a few weeks ago, it was fun throughout. Highly recommend! If you're planning a Ceilidh look no further! The band provided lovely tunes and lively atmosphere. Martin's calling was also very clear. Great music, great show. Silver Street kept a very very large crowd interested in staying on the dance floor instead of at the free/delicious buffet table.